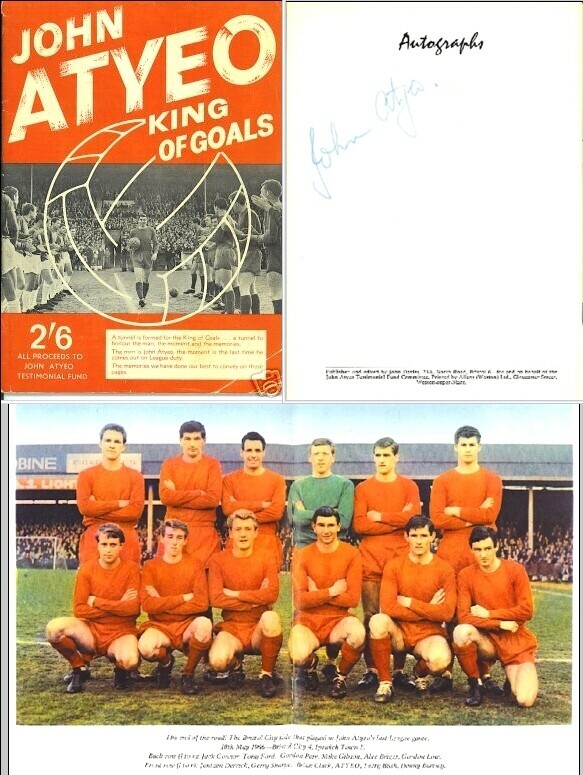 John Atyeo England & Bristol City 'King Of Goals' signed testimonial programme - Rare !!! John Atyeo (7 February 1932 - 8 June 1993) was an English football striker. He was signed from under the noses of League Champions Portsmouth in 1951 by Bristol City. making 647 appearances and scoring 350 goals by the time he retired in 1966. The new stand that replaced the Park End at Ashton Gate in 1994 is named the Atyeo Stand after the one-club man. whose 350 Football League and Cup goals and 597 League appearances for Bristol City will almost certainly never be surpassed. the full story of John Atyeo. Here was a player and a man who made what today would be extraordinary choices in his lifestyle and career. he always said no, he would do it all over again.